A rescued horse, an abandoned ranch and a new beginning for one very lucky girl… Taylor Henry loves to ride, but she can’t afford lessons, let alone a horse. But one day, Taylor stumbles across an abandoned gelding and a pony. Will she be able to find them a good home? Could the empty old stables on Wildwood Lane be the answer? Is Taylor’s dream of owning a horse finally coming true? And will she be able to turn Wildwood into something even better than a home – a working stable where other horse-loving kids can learn to ride? 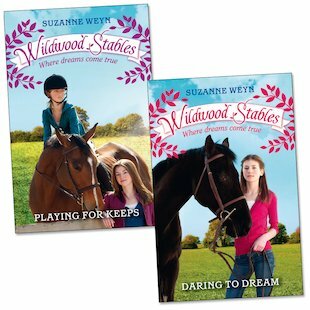 An unforgettable new series for horse-lovers from the publishers of Chestnut Hill and Heartland. In wildwood stables pair thay all had a horse each. Molly’s horse ran away so she started fighting whith kate becose she wanted her horse. Thay stoped fighting whith each over when molly horse came back so molly whent home. I liked the bit wher molly stoped fighting it was the best book i red in my life i loved it. Suzanne Weyn is the author of The Wildwood Stables series, as well as Young Adult books including The Bar Code Tattoo.